Hi! Could you please share a link to the Multifile Upload Field extension? It should work just fine. Feel free to request a refund if it doesn’t work. Hi Preseto, I bought this plugin because I thought it would fix the issue that contact form 7 entries are not being delivered to my inbox. Im still having that issue. Could you help me fix it, please? Hi! This plugin stores all contact form entries in your WordPress admin (Under Contact > Entries) so you no longer have to worry about missing the emails. If you do need to send the emails, see this blog post for configuring the email headers. What is the process for updating this plugin manually and keeping my db entries? When I try to add new and upload the .zip it says the folder already exists. I don’t want to delete it and lose my db… thank you! Install the Envato Market plugin to enable automatic updates of this plugin right from your WordPress dashboard. Remember to specify your API Token in the Envato Market settings page. For manual updates you’re safe to disable and delete the existing plugin, and upload the new one. It will keep all the DB entries and configuration. I have tried manually updating it via FTP files and completely deactivating/deleting the older version and reinstalling, but I get this message every time. Can you please help me figure out why this is happening? This is probably happening due to an old PHP version (before 5.5). Is there a way for you to upgrade to a newer PHP? Which host are you using? Thank you. My client’s host is with GoDaddy and it was running 5.4. I’ve updated it to 5.6 and the plugin activated. which will disable sending the email but will still capture the submission. Can this send a file after successful entry submission? 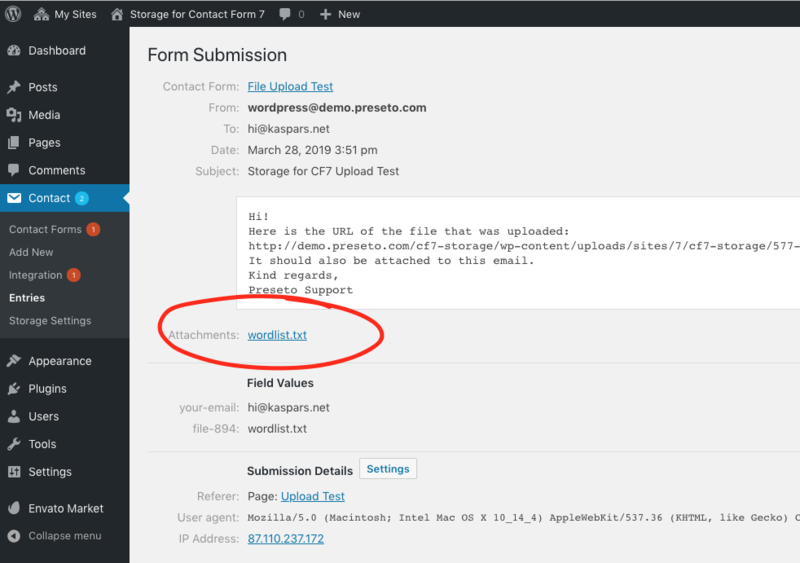 This could be configured using the core Contact Form 7 functionality using the “2nd Mail” option—send an email to the form author with a link to a PDF file. Hi, very interested. Does this plugin store the data even if the person fails to fill in and submit the form? It only stores the form data when a form is submitted and it passes all the input field validation checks. Hello, attachments are not saved in given location …/uploads/cf7-storage/. Please help! Hi! Could you please send me a temporary login information to support@preseto.com and we’ll have a look! 1. Does it display an error message when trying to submit a form with an attachment? 2. Does the single view of the specific submission list the attachment file? 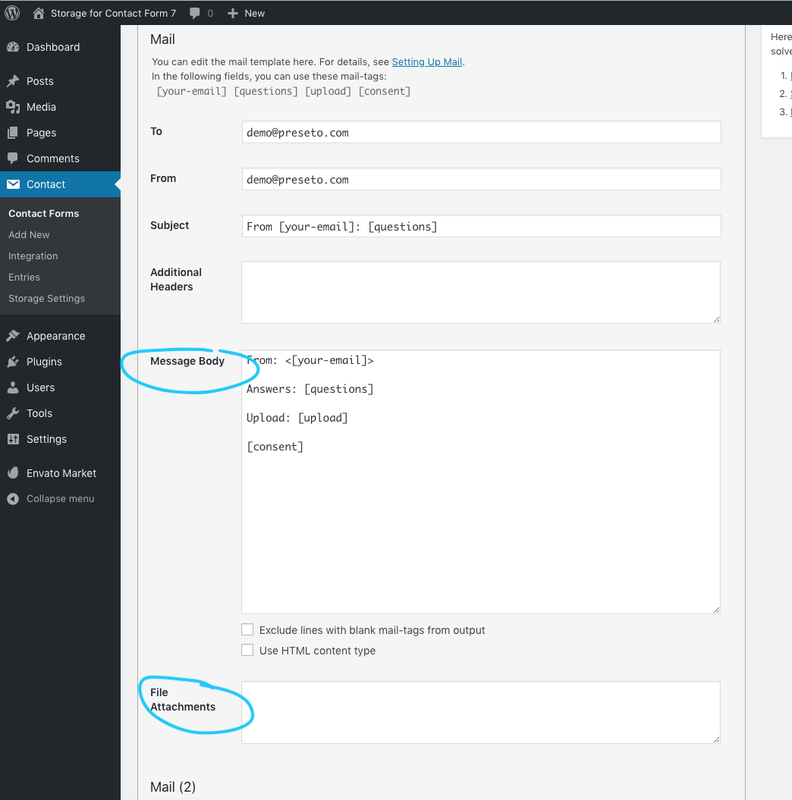 Could you please confirm the version of WordPress core and the Contact Form 7 plugin? Also, what version of PHP is running on the server? Thank you! That specific line is related to looping through all submission attachments. Are you collecting any attachments in your forms? How many and what kind of fields are you using? I’ll try to replicate this issue locally. I’m not collecting attachments, but after they fill out the form, the email gets send with an attached PDF report. Interesting! Could you please email a screenshot of the form “Mail” settings to support@preseto.com? Thanks for getting in touch! I’ve released version 2.0.3 which fixes the issue with local upload attachment references. I’ve also emailed you the latest version since it might take a while for Envato to review the changeset.